What can we learn from the success of Google and Apple? The design philosophies of Google and Apple represent different approaches to new product design. Google's model features bottom-up and data-driven decision-making processes, while Apple's model is to design and build products top-down. Library instruction program design may learn from these differing but complementary approaches. 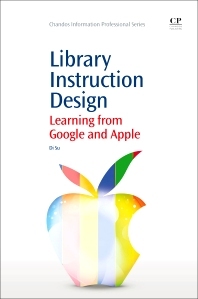 Inspired by Google’s and Apple’s success, Library Instruction Design details how library instruction program design may learn from the philosophy of product design in the business world. In designing library instruction, a Google-philosophy approach teaches what the user wants to know while an Apple-philosophy approach teaches what the librarian thinks the user needs to learn. These two design philosophies aim at different teaching objectives reflecting library and information science education in modern society. The book is divided into five sections, with opening sections covering library instruction, the philosophy of library instruction design and design philosophy from different angles. Later sections discuss applying Google’s model and applying Apple’s model. Librarians, library school teachers, and library school students. Di Su is Associate Professor and Head of Reference Services at York College Library of the City University of New York, USA. A person with a wide range of interests, Di has been a contributor to several publications including Information Outlook; Journal of Electronic Resources Librarianship; The Reference Librarian; and more. He was the editor of Evolution in Reference and Information Services: The Impact of the Internet and Collection Development Issues in the Online Environment. This is his first book with Chandos.